'The Royal Family,' Charles Brooking, c1746, Richard Green Fine Art. 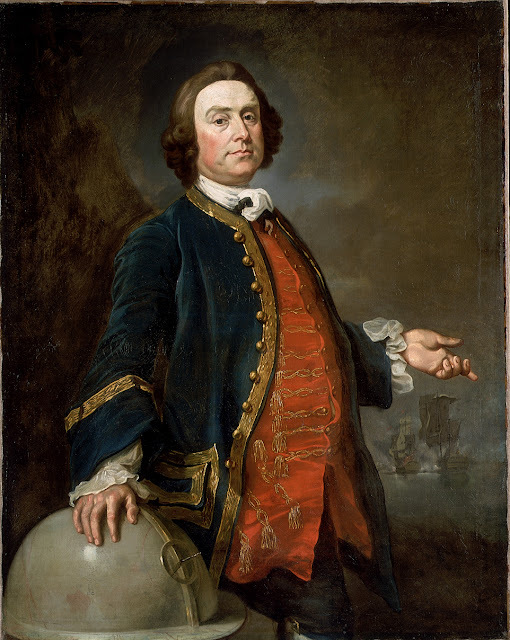 Portrait of Commodore George Walker, artist unknown, c1750, National Maritime Museum. George Walker, pictured here, commanded a squadron of privateers in the War of Austrian Succession that were collectively known as "The Royal Family." Each of the four vessels was named for a royal: King George (the flagship, appropriately enough), Prince Frederick, Princess Amelia, and the far less specific Duke. Crewed by nearly a thousand men, these four vessels wreaked havoc on Spanish and French shipping from Nova Scotia to the English Channel. Most famously, the squadron was part of the battle against the 70 gun Glorioso. Unbeknownst to Walker, the Glorioso had already deposited her cargo of four million dollars in Lisbon when his squadron attacked her at 8:00 AM on an October morning, beginning a battle that would run, almost continuously, for twenty five hours. Two Royal Navy ships joined the chase and fight, one of which (the 50 gun Dartmouth) was destroyed in the process. 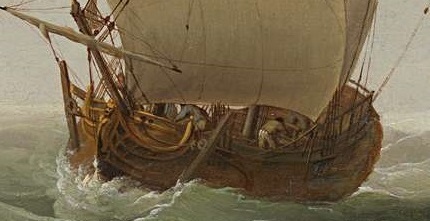 When Glorioso was taken, it was discovered she had no treasure, but was nonetheless hauled into port. Brooking painted the "Royal Family" at work in two separate paintings now available for sale at Richard Green Fine Art. The one features here depicts them sailing in a stiff wind on an open sea. 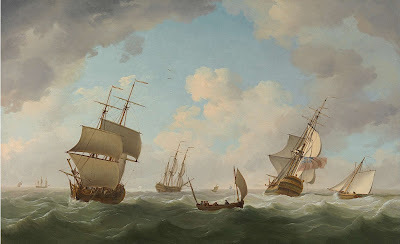 Brooking often includes sailors in his paintings, but his focus has always been the ships themselves, and so details are scant on the men. On the weather deck of this small vessel are a pair of sailors at work. One wears a blue jacket, the other a grey or light brown jacket and white trousers with vertical blue stripes. Sailing away to her larboard is a small skiff with five men aboard. Two of the men in the stern wear reversed cocked hats. The mariner amidships wears a round hat with a rounded crown, and the man further forward wears what appears to be a barge cap. There is again a mix of blue, brown, and grey jackets. 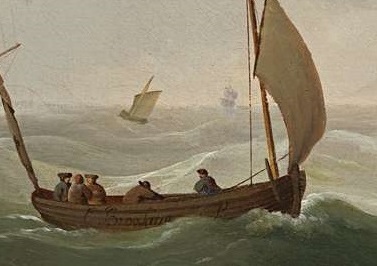 A sharp eyed observer will note that Charles Brooking signed his name along the starboard side of the skiff.